Get Ginger’s Grammar and Spell Check Extension! Write without spelling mistakes and grammar errors in popular websites such as Facebook, Gmail and Twitter. Install Ginger on your Chrome or Safari browser and see your texts being proofread and corrected with a single click. 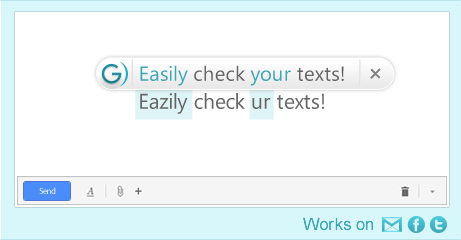 While you write, Ginger automatically highlights any typos or grammar errors that you’ve made in the text box itself. Whether you install a Chrome extension or download from the Safari Gallery, you can simply approve Ginger’s correction by clicking on the suggested text. Read more on Ginger for Browsers on our FAQ Page.